OF all the portraits of past American Presidents, the one most easily recognised by everyone might be that of George Washington by Gilbert Stuart. Every schoolboy knows it; every book on history, or whatever, in the USA carries it. And yet the same President was painted far more often, and from far closer, by another man who knew him well: the painter and museum-founder, Charles Willson Peale, who died in 1827, at the age of 86. Peale rendered Washington as he was, according to one critic: "easy, erect and noble". Seven times he made a portrait of the great general alongside whom he fought in one battle as a militiaman, "while musket balls whistled their thousand different notes above our heads". And yet fame came to him for reasons other than for painting the First American of his generation. While reading about Peale, very much "a man of his remarkable time and place", I picked up an interesting series of facts, none more interesting than this: that of the 17 children he fathered, 11 turned out to be painters, and of them 10 were named after great European artists of the past— Raphaelle, Rembrandt, Rubens, Titian and so on. Enough to confuse any student of art unless he or she were to pay attention to the family name attached - Peale - and of course to the century. Some of them made a name for themselves, as did Charles’ brother, James. One speaks here thus of a dynasty of artists. With us, in India, where the same skills were practised within the same family for generations, this would be nothing unusual. The practice of art and crafts was hereditary here, and one knows, from one’s own work with traditional families of painters, that from father to son and on to grandson, and still further, the same art or craft kept being passed on. If Pandit Seu from the small hill state of Guler was a painter in the 18th century, so were his two sons, Manaku and Nainsukh, and so were Manaku’s two sons, and Nainsukh’s four. Painting was the family’s profession, and continued to be so till late, judging from the fact that Chandulal - who died a few short years ago, and directly descended from Nainsukh’s third son, Nikka - had made a name for himself as a painter. Even at the Mughal court, where a different workshop tradition prevailed, one reads about a painter’s son/s also following the same profession. To wit, Aqa Riza’s two sons, Abu’l Hasan and Abid, were painters; Basawan’s son, Manohar, was a painter; so was Goverdhan, Bhawanidas’s son. The list seems endless. But to get back to Charles Willson Peale. America in the 18th century was a different time, a different place. And there, for a dynasty of artists to have thus been founded was certainly unusual, and even more unusual was Charles’s naming of his sons after great European masters. But then Charles was an unusual person, ambitious and enterprising, ever on the lookout for ‘great subjects’, "ever fond of perpetuating the Remembrance of the Worthies of my time". Portrait painting is something that he taught himself, with some encouragement from friends, for no one in his family had ever had anything to do with art: saddlery was the business they were in. But the required skill once acquired, Charles never looked back. It has been estimated that in his life he painted more than a thousand portraits. 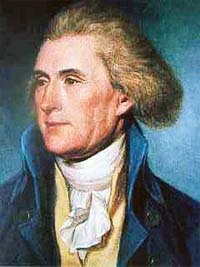 The list of his subjects reads like a Who’s Who of late 18th and early 19th century America, for in it figure Thomas Jefferson, with whom he kept up an active correspondence for years, Marquis de Lafayette, Adams, Madison, Monroe, Hamilton, Thomas Paine. There were other aspects to the personality of Charles Peale, and he appears sometimes to have been a visionary, at others a remarkably shrewd businessman. With him are associated the founding of an art gallery in Philadelphia, the building of a museum of natural history in which for the first time the skeleton of a lately-dug mammoth was featured, and the use of porcelain in dentistry. He even built an enormous and artful triumphal arch for his ‘friend’, George Washington, who had to pass under it while in Philadelphia, acknowledging the greetings of delirious crowds. It was, however, an arch with a difference, for, from it a crown of laurel leaves fell on to the head of the passing President when Peale’s daughter pulled a secret cord. He was not above this kind of showmanship. But there is also something deeply human, and heart-warming in the manner in which, in his advanced old age, he decided to take lessons in landscape painting from his own son, Rembrandt, who excelled in this field. The simple epitaph on the long, low grave in Philadelphia where he now lies, sums this uncommon man well, perhaps. For it reads: "He participated in the Revolutionary struggle for our Independence. As an artist, contributed to the history of the country. Was an energetic citizen and in private life Beloved by all who knew him." In 1980, an enormous microfiche edition of Charles Peale’s collected letters, journals, and memoranda was published by the National Portrait Gallery in Washington. On that occasion, the editor of these papers did something unusual: she invited all the known descendants to a celebratory reception. About 40 of them could be located with ease, and they all came. Many of them had never known one another, and did not even know of the others’ existence. The editor made one discovery. In every branch of the family, in every generation, she found out, there was an artist. "There must be something hereditary about the relationship, say, between the eye and the hand", she said.